3.5 billion dollars. Imagine Montgomery County with $3.5 billion of additional wages. Can you picture the thousands of new jobs? How about all the new restaurants, stores and entertainment options? Can you visualize the millions of extra tax dollars that we can use to educate our children, improve our commutes, and provide services to our neighbors in need? The transformation of the White Flint area into a smart growth, mixed-use, transit-oriented neighborhood will generate that $3.5 billion, according to the White Flint Sector Plan Executive Summary of Fiscal Impact Projections. How do we get to such a significant number? Let’s say Marcia from Silver Spring, her freshly minted Bachelor of Arts hanging on the wall, finds a job as the membership manager for an association which opened an office in the revitalized White Flint area. Marcia spends some of her $50,000 salary on avocado toast and lattes which supports jobs in the new Avocados-R-Us restaurant. She rents an apartment at a recently built twenty-story building with a crackerjack front desk staff (more new jobs.). Needing to burn off all those avocado toasts, she contracts with a personal trainer (another new job.) She bikes to work using bikeshare who hires a logistics genius to meet this increased demand (yes, another new job.) Her parents are so thrilled she has stayed in the area they treat her to new furniture which creates more new jobs. 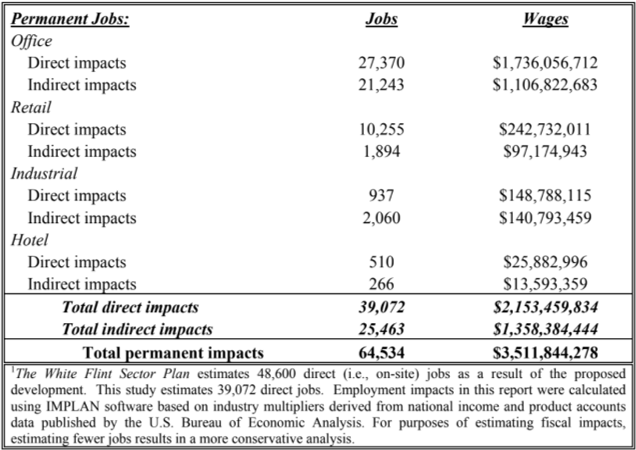 The multiplier effect from Marcia and all the other people enjoying their new jobs creates $3.5 billion of wages. But the good news doesn’t end with wages. When the White Flint 1 Sector Plan has been fully implemented, we will have created more than 11,000 housing units and thirteen million square feet of commercial space. Fully developed, the projected assessed value of the property in the White Flint 1 Sector Plan is projected to be $9 billion. In the future White Flint neighborhood, each year Montgomery County earns approximately $169 million from property tax, income tax, and other taxes. That’s still $126 million after netting out the costs to the county for public safety, libraries, transportation, recreation, etc. There are also infinite intangible benefits to the transformation of the White Flint area. A vibrancy, a sense of place and community, and amenities ranging from parks to transit to retail create a buzz that makes White Flint a place in which people want to work, live, and play. The White Flint/Pike District/North Bethesda area – it is a land of many names as well as many possibilities — will become one of the main economic engines of Montgomery County as the master plan vision moves to reality. But it only becomes reality if government, developers, business, and residential leaders do what it takes to ensure the White Flint sector plan moves steadfastly forward. Infrastructure projects, private-public partnerships, and community support can transform the White Flint area … and provide a much-needed expanded tax base for Montgomery County. Such change doesn’t happen with good intentions and vague platitudes on economic development. It requires laser-focused leadership and innovative vision from our elected officials. As you ponder which candidates deserve your vote, imagine that $3.5 billion and all that it can do for our quality of life here in Montgomery County.